Retired Judge Richard Davis passed away last Thursday at his home, just three days before he would have celebrated his 94th birthday. To say that Davis lived a long, fruitful life would be an understatement, according to his son, Bruce Davis. A 1942 Hillsboro High School graduate where he was student body president and a captain of the basketball and football teams, Davis went on to Ohio State University and earned a business degree and a juris doctor of law degree in six years. He was a member of the OSU basketball team that won the Big Ten Conference championship in 1944 and made it to the NCAA Tournament Final Four in 1944 and 1945, according to his obituary. Davis was Highland County Probate and Juvenile Court judge for 29 years. Prior to that, he was prosecuting attorney for 12 years. He was a recipient of the Superior Service Award from the Supreme Court of Ohio. His was one of the three Juvenile Court Judges who participated in the drafting of The Four-Year Strategic Plan for Children Services in Ohio. He was a member of the Ohio Probate Judges Committee that drafted the new Standard Probate Forms approved by the Supreme Court of Ohio and still used today. He was the author of numerous published law articles including opinions published in the Ohio Official Reports and the Ohio Northern College of Law Journal, his obituary said. He was a past president of the Hillsboro Rotary Club, Hillsboro Lions Club, HHS Alumni Club, HHS Athletic Boosters, Highland County Bar Association and Southern Ohio Genealogical Society. He was inducted into the HHS Athletic Hall of Fame in 2002. He served as chairman of the Highland County Children Services Board, Salvation Army and Crippled Children and Adults Society. He was the recipient of the Masonic Ohio Grand Lodge Community Service Award, was a 60-year member of Highland Lodge No. 38 Free and Accepted Masons and was a 32nd Degree Scottish Rite member of the Valley of Cincinnati. 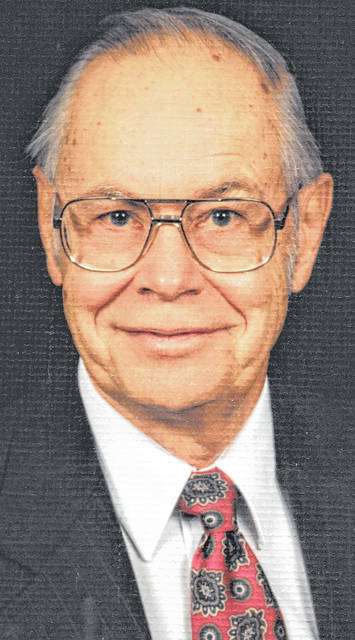 He was a lifelong member and former lay leader of the Hillsboro First United Methodist Church, according to his obituary. He is survived by his wife and high school sweetheart since eighth grade, Kathryn (Tolle) Davis, and two children, Bruce (Sally) Davis and local attorney Susan Davis (Steve) Thompson. The judge’s approach was one of seriousness and commitment to the various endeavours of his life, but Abernathy told The Times-Gazette that Davis possessed a great sense of humor laced with a sharp wit. Fellow Rotarian and Times-Gazette media representative Chuck Miller fondly remembered several occasions when Judge Rocky Coss and the late Judge James Hapner would join in, ensuring the meetings would not only be productive, but entertaining at times. “He was a good dad,” Bruce Davis said.